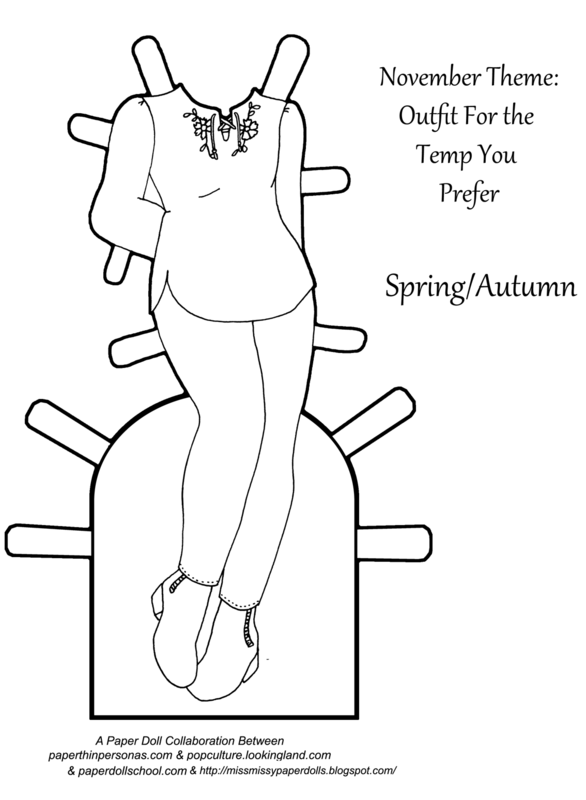 Today’s Printable Paper Doll Inspirations:Clothing for the Temp I prefer. I can’t believe this is the last paper doll post of 2017 and the last of the collaborative paper doll I created with Boots of Popculture Looking Land, Julie of Paper Doll School, and Miss Missy of Miss. Missy’s Paper Dolls. What a fun project it has been! We are planning to continue in 2018, so fear not! I know I’ve had several people tell me how much they have enjoyed this little project and we’ve all enjoyed it too. Well, I hope everyone has. I have and that should be something. For December, the theme was to draw clothing from the temperature/weather that you most enjoy. Personally, I am a temperate loving gal. I prefer long pants and not having to wear a coat all the time. So, that is what I created for today’s Paper Doll Collaboration 2017 post. While I haven’t seen anyone eles’s contributions to the December paper doll theme, I thought I would share my favorites from everyone’s year. So, I picked one from each blog. Julie also deserves props for stepping up and creating the doll pose we all used. From Popculture Looking Land, my favorite was probably her amazing paper doll version of Cihuateotl for our Halloween Vampire themed edition. Those skulls! Those feet! That truly creepy Aztec Goddess. From Miss. Missy’s Paper Dolls, I loved the set she created when we did the theme, last month, of personal heros. Her artistic inspirations were highlighted in a wonderful set of paper dolls. Plus, who doesn’t love a little Salior Moon in their paper dolls? To see this month’s paper doll outfits, and all of those from this year, head over to Paper Doll School, Miss. Missy’s Paper Dolls and Popculture Looking Land. A big thank you to Julie, Boots and Missy for making this such a wonderful project in 2017. Looking forward, my friends, to 2018! Aww… thanks 🙂 You were the real chairperson of this project & it would have never happened without you! If we’re picking favorites — which I really can’t — I loved your music entry. Missy’s Rococo was very nice and Boots created a fantastic Sekhmet. I’m so ready for the 2018 set!! Well, project management is kinda what I do for my job, so I might as well convey it into paper doll form! But seriously, you guys were the easiest team to manage ever. It looks comfy! I’m excited to see what the new year brings with the collaboration! Nice job. BTW – PDF version’s not working. Super! Can’t wait to see it! What happened to Popculture Looking Land’s December contribution? I’ve checked everyday and she still hasn’t posted. I don’t see ny activity on her site. Am I missing something?